Trump wants to cut health research. This Republican won’t let him. Chairman of the House subcommittee that allocates funding for the NIH, Rep. Tom Cole (L) (R-OK) has presided over some of the biggest federal health research funding boosts in recent years. The Republican leadership in Congress wants to cut spending on public health and repeal Obamacare. Yet when it comes to medical research, they’re willing to throw down extra — even when President Trump wants to cut back. In the administration’s first comprehensive budget proposal, out today, Trump is expected to call for a $5.8 billion trimming of the National Institutes of Health’s budget as part of an effort to curtail spending while increasing America’s already gigantic defense budget and expanding tax cuts. But that request will likely be dead on arrival in Congress, largely thanks to two senior Republicans who’ve become champions of health research, persuading their fiscal conservative colleagues that money for the NIH is money well spent. 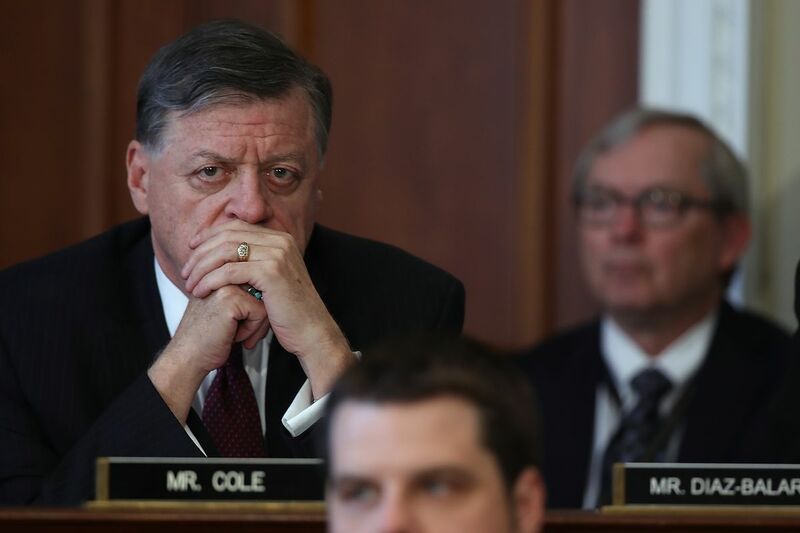 One of them, Oklahoma’s Rep. Tom Cole, is the chair of the House Appropriations Subcommittee on labor, health and human services, education, and related agencies, which controls the NIH budget. Cole voted to repeal the Affordable Care Act, but together with his Senate counterpart Roy Blunt (R-MO), he’s led Congress to approve more money for the NIH than either President Obama or President Trump requested. In a spending agreement to keep the government running through September, for example, they said no to Trump’s request to cut the NIH by $1.2 billion. Instead, they opted to increase the agency’s budget by $2 billion, or 6 percent, for the second year in a row — and they’re expected to do so again for 2018. But Cole insists it’s not just the personal that drives his policymaking — it’s simply that funding medical science is a no-brainer, good for Americans individually as well as for the economy. I reached out to Cole to try to and understand why Republicans support health science while denying other kinds of science and how medical research became a bipartisan issue. We also discussed why Trump is much more likely to have to deal with a pandemic than an act of terrorism, and how he’ll respond to the latest budget. Our conversation, edited for length and clarity, follows. You’ve become one of the great champions of health science in Congress. How do you make the case for investing in medical research to your fellow lawmakers? I was a big believer in the merits of health research, partly because it’s simply the right thing to do: We all know people — their families go through cancer or Alzheimer’s. But from a fiscal standpoint, you really can bend the cost curve [by investing in research]. Right now, we’re spending about $259 billion a year looking after Alzheimer’s and dementia patients through Medicaid. That problem only gets worse [with the aging population]. Spending a few hundred million to try to at least slow down the progression of the disease is not only humane and the right thing to do — it’s the fiscally prudent thing to do. We also have to look at these things from a broader perspective than just dollars and cents, and look at what the benefits yielded to the American people are — and beyond that, to humanity. When I was on state and foreign operations, I voted for PEPFAR [America’s global heath program to combat AIDS] back when George W. Bush was the president. The payoff there was enormous in terms of human lives saved and goodwill earned for Americans. We could do something that literally others couldn’t do for themselves. It was the same thing with Ebola. To me, this is one of the easiest cases in government to make. Cutting [health research] is penny wise and pound foolish. You hurt your ability to deal with disease in your country — and disease is enormously expensive not just for individuals but society in general. The Trump administration’s newest budget proposal once again contains cuts again to health research. Are those cuts are going to be dead on arrival in Congress? I can say NIH will remain a priority in my budget, and we’re going to do everything we can to stay on the course we’re on — which is predicable and modest increases in funding. We certainly don’t have any intention of major cuts there, but [we know we’re] going to be presented with tough choices. To get the increase, we have had the last two years, we’ve had to make hard decisions about other places [in the budget] where you’d like to do more but you can’t. I am a defense hawk — from a big defense district — and I don’t have a problem with the president’s proposal on defense. But I also recognize you don’t just defend the American people against terrorist attack but against pandemics as well. And you’re a lot more likely to die in a pandemic than a terrorist attack. To cut NIH so we can spend more on defense is not the appropriate balance. We also live in a world with Ebola and Zika and SARS — and I promise you the president is much more likely in his term to have a deal with a pandemic than an act of terrorism. I hope he doesn’t have to deal with either one, but you have to be ready to deal with both. Biomedical research is like the military: You can’t create it overnight. You have to make sustained investments. How did funding the NIH become a bipartisan issue? It’s something the parties have been very unified on, and it’s a place where Congress is taking the lead. Disease is so intimately familiar to people. Each year, about 1.6 million Americans will contract cancer. Tens of thousands die. If you had Alzheimer’s or some crippling disease in your family, you see [its impact]. More than a mission to Mars or something more abstract in terms of physics, this is something people see directly in their daily lives. It’s appropriate for the federal government to do what it can. I don’t begrudge the other areas [of science] — but this is probably an easier one to convince people about. Do you think it’s problematic that while lawmakers seem to agree on the merits of medical science, other areas of research — like climate science — don’t get that same bipartisan support? How do you draw that distinction? There’s a whole variety of areas we want to be well informed about, and you want to know the reality of climate science — then let the debate occur over what’s the appropriate response. [We know] the globe is warming — but what is the best ways to handle it without destroying the economy in the short term? I do find a lot of climate change advocates don’t give much to thought to throwing people in oil and gas out of work. And that about 80 percent of the power we get today is carbon-based. But you have to have good science to begin with. We can debate the policies — and that’s fine — and we quite often find you have ecological impacts. But don’t try to shut off the science because you don’t like what the science is telling you. So denying money for scientific research is really a mistake. You want to make the best-informed policy decisions you can and that usually comes out of robustly funded science. Does it concern you that Environmental Protection Agency is losing independent scientific advisers and that Trump has virtually no science advisers? It does. You want to find good science. It’s usually at the heart of good policy. There’s a big difference between research and then the practical decisions you make on the basis of that research. You want the best information you can get. I live in Oklahoma, in Tornado Alley. We are interested in climate research. We have the National Severe Storms Lab in Oklahoma. When I was a kid, you used to get three minutes of warning on a tornado. Now you get 15 to 20. Even in weather — the most difficult and uncertain of science — people really benefit from this. It saves a lot of lives. We saw tens of thousands of people fan out across America for the marches for science this spring, and they were largely seen as a response to the Trump administration. Does it bother you that being Republican is now associated with being anti-science? It’s annoying for me when I know what the record is. It was Republicans who doubled the size of the NIH. It’s Republicans who proposed twice as much money as President Obama did in 2016 and twice as much again as he did in 2017. So I think we get a bum rap in some of these areas in terms of who is willing to fund it and who is not. The politicians need to quit playing into stereotypes. No offense to my friends on the Democratic side, but they love this argument [that Republicans are anti-science] and fan it as if it’s true. They wrote a letter to the Wall Street Journal claiming they got $2 billion for NIH — and the WSJ printed it like it’s true. I wrote in and said that’s wrong. We proposed that $2 billion increase — and it was twice as much as the Democratic administration proposed. I’m not critical of the Democrats because they were helpful. It’s actually a bipartisan victory — and a victory of the legislative branch over the executive branch because both Obama and Trump proposed less than the Republicans and Democrats [in Congress] wanted. So let’s not make everything become partisan. You’ve had success in your role as chairman of the subcommittee on labor, health and human services, education, and related agencies getting past party lines to get things done. How do you do that? When I became chairman, I said, “We are going to have a lot of hearings,” and almost tripled the number of hearings we had versus my predecessors. I wanted to find things we agree on. You bring the best experts in the world in, and let the members ask questions, and listen to the questions they ask. If you let hearings take place, you can tell people get excited. On my committee there were areas the Republicans and Democrats wanted to work together whether they knew it or not. NIH and disease research is one. Early childhood education [is another]. Disease research is the right thing to do for this country. It’s also the smart thing. So is helping people who haven’t had a chance to get into college, and don’t have the means to. Those are things I don’t see as liberal or conservative — they just seem smart.